George Mason University’s Arlington Campus has always claimed a unique mission, namely to serve Arlington as a community, cultural, and educational center. The 2011 completion of the 256,000 square foot Founders Hall was a continuation of the expansion that has been ongoing in Arlington since the 1980s. The campus, home to the School of Law and many graduate programs, has played a distinctive role in the community since its inception. George Mason University will forever share a special bond with Arlington. It was an Arlington lawyer and later Delegate, C. Harrison Mann, Jr., who teamed with a fellow Arlingtonian, Clarence A. Steele, to establish the branch of the University of Virginia, which would eventually become George Mason University. Less than one mile to the west of the Arlington Campus is Washington – Lee High School, which in 1949 housed the Northern Virginia University Center. Its director, John Norville Gibson Finley, would become the first chief executive of George Mason College in 1957 and oversee the construction of the Fairfax Campus. The citizens of Arlington themselves would band with other northern Virginia municipalities to nurture, finance, advise, and build George Mason University beginning in the middle of the twentieth century. 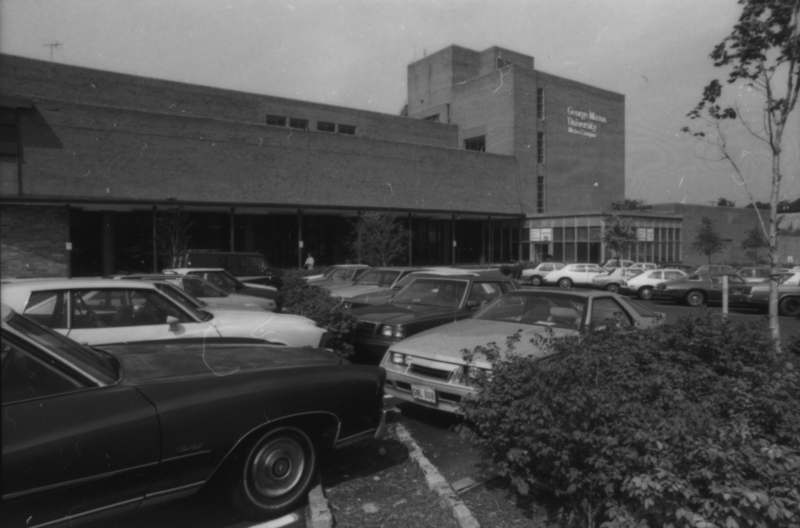 On November 28, 1978 the George Mason University Foundation acquired eleven acres of land and a single building: the twenty-five year-old former department store belonging to the International School of Law in the Virginia Square section of Arlington. The two institutions expected that they would merge the next year to form a new law school. Indeed, they did. The Virginia General Assembly approved George Mason’s union with the International School of Law in March of 1979 creating the George Mason University School of Law, while simultaneously recognizing the university as a doctoral institution. This ended the university’s difficult struggle with state authorities and gave Mason a distinctive program to feature at Arlington, beginning July 1, 1979. The George Mason University Foundation later sold approximately half of the land on the western side of the parcel to the Federal Government for nearly five times the amount it paid for the entire property. On it the Federal Deposit Insurance Corporation built its L. William Seidman Center. Other programs and institutes, like the Center for the Productive Use of Technology (founded originally as the Center for the Improvement of Productivity in 1983) and the Law and Economics Center, soon followed. University Provost, Dr. Clara Lovett, established the one-of-a-kind Center for European Community Studies in October of 1989 to study the effects of Europe’s change from the European Common Market to the European Union. Due to the lack of space in the nearly-full law school building (the campus’ second building would not be completed for nearly six years) the university chose to rent the fourth floor of the new Quincy Street Station building about one-third of a mile to the west at 4001 Fairfax Drive. The Center for European Community Studies became one of the first programs of the International Institute, which Dr. Lovett established in 1990 as “the focal point for developing and administering the university’s international programs and activities.” The Institute, also housed at Quincy Street, also featured the Office of International Exchanges, the Center for Global Market Processes, and the Master of Arts in Interdisciplinary Studies (MAIS), which later became the Master of Arts in International Transactions (MAIT). The International Institute was incorporated into the Institute of Public Policy in 1997, which became the School of Public Policy in 2000. The MAIT degree then became the MA in International Commerce and Policy and was offered through the School of Public Policy. In addition to the School of Law and these programs, the campus was also home to Arlington’s community public television station, the Arlington Campus Art Gallery, and the Small Business Development Center. While the School of Law anchored the Arlington Campus, the university realized that additional programs and facilities needed to have a “logical, symbiotic relationship with the Law School…and be able to stand real separation from the main campus” which was fifteen miles away in Fairfax. The university chose not to view Arlington as a branch campus, but rather as one component of their “distributed university” concept. To the university: “Northern Virginia [was now] its ‘campus,’ which it [would] serve through major academic centers and access to business locations and other schools throughout the region.” The administration wanted to ensure that the programs that were housed at Arlington complemented the environment of the law school and simultaneously served the people of Arlington while utilizing the area’s resources. Focusing on this idea, plans for expansion were drafted. The School of Law was situated in what had previously been Kann’s Department Store, a building which was built in 1953. Featuring a working escalator, the building was known on campus as “Arlington Original” or simply “Original.” University officials decided that new construction would be staged in three phases, encompassing 750,000 square feet above ground with underground parking for at least 1000 cars. Phase I, scheduled for completion in 1998, was to provide a modern home for the School of Law and its rapidly expanding library—which had grown from over 100,000 volumes in 1979 to over 300,000 by 1994—at an estimated cost of $18 million. It would be built on the law school’s parking lot. Two additional buildings on the site were to be constructed, the second of which would eventually replace the Original building altogether. Phase II was to be constructed by 1999, and Phase III, adjacent to the FDIC Building, was planned for 2004. Development of the 5.2-acre Arlington site was reaching a critical phase, as the university had heeded a planning committee’s suggestion that “strongly recommend[ed] the Arlington Campus be rebuilt to house greatly expanded programs of post-graduate, professional and continuing education studies and of lectures, conferences and cultural activities.” When the School of Law was originally chartered in 1979, it served approximately 450 students; by 1989 1,200 students were enrolled in programs at Arlington (700 of them in the School of Law), and enrollment by 1999 was projected to reach 4,000 students. Ground was broken in April 1996 for the $19 million first phase of construction on the site of the Original building’s parking lot. By 1998 the new building—Arlington I—was completed, and after its dedication in January 1999, the School of Law and its library, as well as the Mercatus Center and the Institute for Humane Studies, moved in. The Mercatus Center, formerly the Center for Market Processes, is a think tank which conducts research, education, and outreach to advance market-related ideas; the Institute for Humane Studies is an independent, nonprofit organization that merged with the Atlas Economic Research Foundation to promote “many of the principles of a free society while assisting market-oriented intellectuals and scholars” through seminars and fellowships. The newly-built Arlington I was described by University officials as a “state-of-the-art educational facility,” which housed over 360,000 volumes in its four-story circular library and boasted three new computer labs. Additionally, it featured integrated data outlets to provide Internet access at each desk. The programs housed in the Quincy Street Station location, such as the Institute of Public Policy’s M.A. in International Commerce and Policy program, moved into the Original building in 1999, joining other programs already established there like Nonprofit Management, Actuarial Mathematics, and Economics. Phase II expansion was to include a 240,000-sqaure foot building and public plaza between Arlington I and the Original building and would house a library, art gallery, and large auditorium. In 2000 the university rented the Truland Building from the Truland Group, a local electrical contracting firm, to accommodate several of its programs while the second and third phases of construction were underway. Student Health Services moved to the Truland Building in 2002, and the School of Conflict Analysis and Resolution (formerly the Institute of Conflict Analysis and Resolution) relocated from the University Townhouses in Fairfax in 2004. The Foundation Building, situated between the Law School and the FDIC headquarters, was completed in 2006. Built by the George Mason University Foundation in an attempt to alleviate parking shortages created during the construction of Arlington II, it houses reserved spaces for students, faculty, and staff; its office space is leased to SRA International, a contracting firm specializing in national security, civil government, and global health. Arlington I was renamed John T. Hazel, Jr. Hall—or “Hazel Hall”—in 2005. Hazel, known to friends as “Til”, was an attorney and real estate developer and had been the driving influence behind Mason’s acquisition of the Law School. He had served the university in a variety of ways—as a member of Mason’s Advisory Board, a member of the first Board of Visitors (and later as Rector), and as both member and chair of the Board of Trustees of the George Mason University Foundation, which he had helped to establish. Although the completion of Founders Hall (Arlington II) -- home to the School of Public Policy and the Mercatus Center—in 2011 marked a pause in the decades-long expansion of the Arlington Campus, the academic excellence and community enrichment that the campus pursued from its inception continues. Browse items related to Arlington and the Arlington Campus.